The IC3 has received over 40 complaints since May 2011 reporting the receipt of an unsolicited e-mail purportedly from a specified utility company. The e-mail stated the recipient had a new bill which needed to be paid, and the bill was attached to the e-mail. The recipient was instructed to click on the attachment to view their bill. The attachment contained a zip file with a computer virus. The IC3 has received several complaints from businesses regarding an e-mail, purportedly from the BBB, which states the BBB has received a complaint from a customer regarding their business. 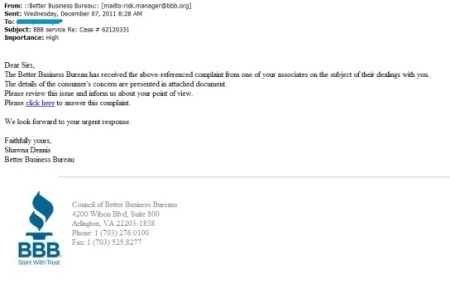 The recipient is asked to review the complaint attached to the e-mail and respond to the BBB. The file attached to the e-mail contains a virus. 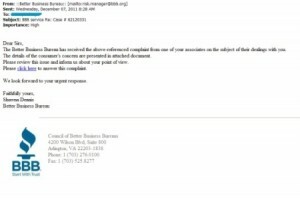 In one complaint received by the IC3, a business claimed their computer was infected with a virus after opening the attachment in the e-mail they received. As a result, the business lost nearly $100,000 when fraudsters successfully wired money from the company’s bank account after the virus enabled them to capture passwords and other important banking information. Better Business Bureau is issuing an urgent SCAM alert cautioning businesses and consumers about an email that looks like it is from BBB, with the subject line “Complaint from your customers.” This e-mail is fraudulent; ignore its contents and delete it immediately. If you have already clicked on a link in the e-mail, run a full virus scan of your computer. The IC3 continues to receive complaints regarding moving company scams. The complaints received at the IC3 do not appear to be linked to each other. There are many individuals who take advantage of those posting moving services on-line, receive an estimate for the service, and hire the company. Scams include the company showing up, and the estimate suddenly doubles or additional fees are added; the counterfeit check scheme, where the victim is selling an item on-line, and the buyer claims a moving company has been hired to pick up the merchandise, and the buyer pays for the merchandise with a check written for more than the price of the merchandise; and after loading and driving away with the customer’s property, the moving company later calls to inform the customer they must pay more if they want to see their belongings again, basically holding the property hostage. Often, even after paying the additional costs, deliveries were late and many of the customers’ items were damaged or missing. Those who refused to pay the additional cost were told they would not receive a refund or their belongings. What happens when your web browser becomes the “bot?” A look at a current Trojan infection campaign similar to the infamous Zeus malware makes open source web browser users a bit nervous. The way it builds the malicious code into the open source browser is notable, because it uses the design of the browser against itself. In the past, researchers have seen threats create malicious extensions. Users would have to disable that particular add-on, which would eradicate the threat. For this particular piece of malware, this is not the case. Since it is a component, it does not appear as an add-on in the browser’s Add-ons Manager in the same manner other extensions and plugins appear. Furthermore, due to the design of the open source browser, the Trojan will be reinstalled every time the browser establishes a connection to the Internet.